Welcome To the Brave, New World of Consumer Generated Marketing – StratGo Marketing. Plug-in marketing department services. I don’t think the marketing team at Kraft Foods Australia is playing any “Men at Work” music these days. Then again, maybe they’re blasting it through the halls. In case you don’t remember the reggae-influenced 1980s rock group, chances are you’ve heard their song “Down Under,” which contained this classic lyric: He just smiled and gave me a vegemite sandwich. Welcome to the brave, new world of consumer generated marketing and the great 2009 Vegemite controversy. First, what the heck is Vegemite? Well, it’s a yeast-based spread that the company says is “one of the world’s richest sources of B group vitamins.” Fine, so what’s all the fuss. Vegemite is an iconic, loved brand in Australia (annual sales are more than one jar per person) and well, consumers can get pretty riled up when they feel that their beloved brand is being messed with. Some Coke veterans in Atlanta can relate. Australian consumers helped pick the original Vegemite name for the 1923 product launch. Earlier this year, the company took a page from its brand history and decided to have consumers help name a new dairy-based spread with cream cheese, to be s0ld in addition to the original product. 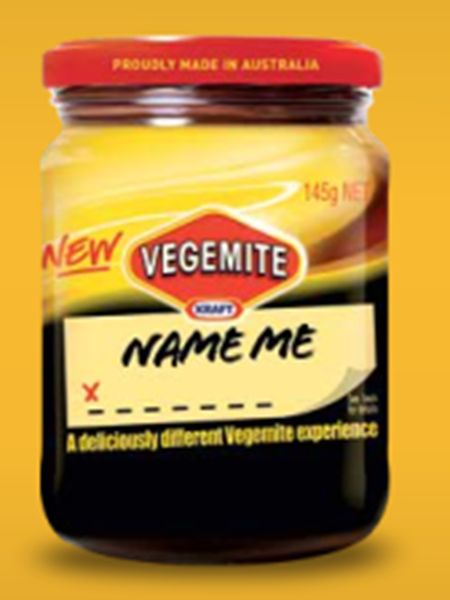 In an interesting twist, Kraft actually launched the new product in July while the contest was taking place, calling it Vegemite Name Me. The naming contest was heavily promoted and advertised on television, and had great response: 35,074 people participated; 48,243 names were entered; and of those, 16,071 names were unique. 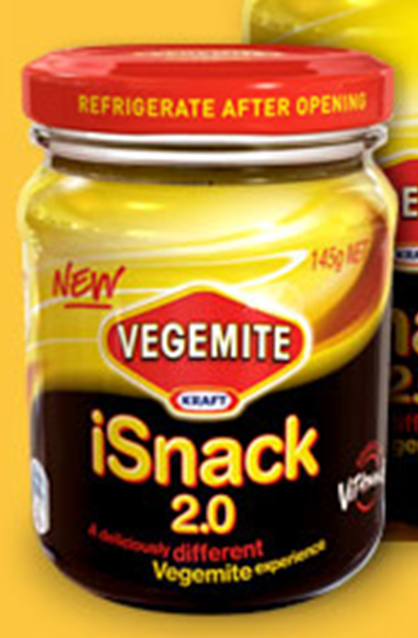 Finally, Kraft announced the new name on Saturday September 26th: iSnack 2.0. We’re all in unchartered territory with consumer generated content/consumer generated marketing! It will be fascinating to see how it plays out in the coming years. If you’re thinking about ways to include consumers or customers within your marketing mix, just remember this: make sure whatever you do is consistent with your marketing strategy and desired positioning, and then be prepared for anything and everything. This Vegemite marketing is action packed for a six-day period. It sure does feel a bit too choreographed. But, what do you think? Update October 7, 2009. Kraft Foods Australia announces new name: VEGEMITE CHEESYBITE. Over the weekend, Quantum Market Research conducted an online and telephone poll, to which more than 30,000 people voted. ← Testing New Choices: What’s For Lunch, Mom?